Here's a screenshot of Syrian flags from a Al-Jazeera news channel broadcast taken on July 19. The image shows a row of four unidentified flags, all of them military-related. They are (left to right) the Navy, unknown (? ), Army, and Air Force (the emblem is a combination of the two old Air Force flags). Nice catch, Esteban. We are lucky to have a chance document these now, being as they are likely to be toast soon along with the institutions they represent. 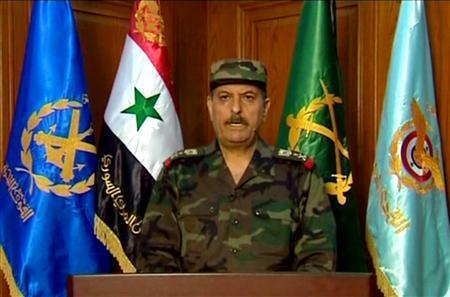 It looks like the second flag from the left, which is based on the Syrian national flag, has extra text and a coat-of-arms in the upper hoist. Since the news report is about the death of the Defence Minister and his replacement, it seems like the flag might be the Defence Ministry (or Minister's) standard. It is similar to the flags from UFE 11-19 and UFE 11-21. 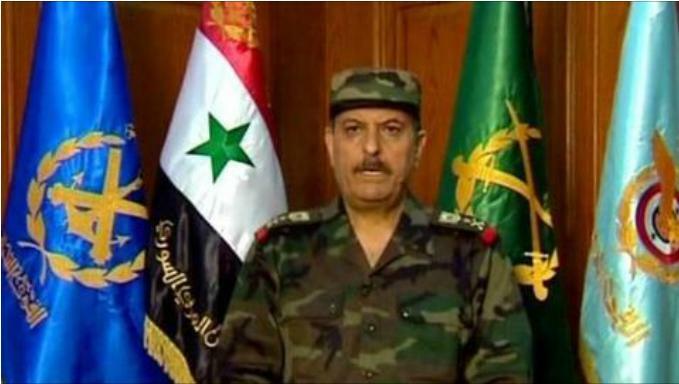 The Yoopya site, whatever it is, 19 July 2012 documented this image as "Syrian General Fahad Jassim al-Freij is seen in this handout released by Syria’s national news agency SANA on July 18, 2012. REUTERS/Sana/Handout/Files". Their actual image isn't quite as detailed as our copy, but as it's not cut as narrow, it shows more of the top of the flag. This may well be the General Fahad Jassim al-Freij releasing to the press the information that Minister of Defence Daoud Rajiha, who had been killed in the country's turmoil. An earlier photograph of the minister, shown by the Australian Broadcast Corporation, also includes the top of the flag behind him: This shows some details that aren't visible in the first picture. Combining the two, I'd say the symbol in the canton is a wreath around a combined symbol of a foiled anchor, two crossed swords, and two spread wings. Most likely the latter are the bird that's also visible on the air force flag, just as the swords show in the Army flag and the anchor in the Navy flag. The symbol would thus combine the charges of the three branches. As for a Ministry of Defense flag, I'm not sure. In both images I found, the flag appears in relation to the ministry of defence. The flag would seem to have the position of honour over those of the three branches. 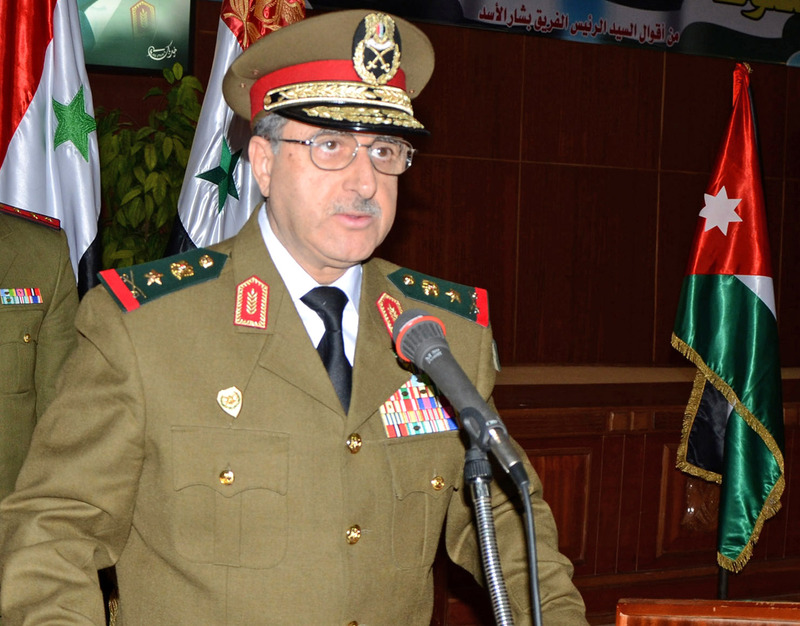 Yet, a similar symbol in Lebanon represents the military general staff, rather than the ministry. This too would make sense in the context. I hope someone will be able to read the script sometime and help us out. On the Warflags website, the flags of the United Arab Republic of 1958-61 are shown. The Air Force ensign is almost identical to the current Syrian Air Force ensign [below], which leads me to suspect other Syrian military flags might also be carryovers from the UAR period (as is, most prominently, the current Syrian national flag). This photo shows a Syrian military colour (or ceremonial flag) during a parade in the Syrian army academy (photo taken presumably in the 1970's). 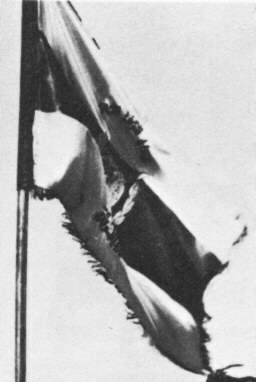 The flag is a horizontal triband (light-dark-light) with a device in the center and fringe around. Source: Kampf-Magazin 8: Östliche Allianz – Nahost, Eshel-Dramit (Hod Hasharon), 1980. p. 8.